GEORGE DOWELL is set to begin a new era at Worthing Football Club after taking over as the majority shareholder of the club. Rebels’ problems have been well documented in recent months and club director Ian Hart admitted that, without Dowell, he doubts the club would have a future. The 22-year-old, a promising footballer in his teens, was left paralysed from the chest down after a car crash in April, 2010. He was in hospital for ten months and said he has since been getting his confidence back but is now looking forward to running Rebels, saying football is his passion. Inspirational Dowell has been confirmed as a director of the club and has the majority share-holding, which was passed by shareholders after it got the required 75 per cent agreement. Dowell will run the Worthing Football Centre out of Woodside Road, on which he has a 25-year lease, with a 3G pitch being installed for the start of next season. The club’s debt will be restructured and talks are still continuing about the set-up of the club but things are expected to be finalised within weeks. Dowell played for Worthing United from under-five right up to under-18 and also played for Rebels’ under-18 team. He was twice named as a substitute for the first team, while he was set for English Schools trials in the summer of 2010. He got back involved with football last year, firstly as a committee member at Worthing United, before he set up Worthing Borough in the West Sussex League last summer. 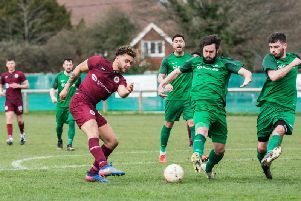 The club are leading the way in Division 5 South and Dowell’s long-term aim is for Borough to play in the County League and link-up with Rebels. The former Thomas A Becket, St Andrew’s and Worthing College student decided to get involved with Worthing Football Club after reading about their plight in the Herald in November. He cannot wait to get started and said: “I saw it in the paper when the news broke that they were struggling a bit and I spoke to Ian (Hart; club director and under-18 manager) and he said that if I was sure it was something I’d like to get involved in, he’d help me out. “It definitely was something I wanted to get involved in. It’s a club I used to play for and football is my passion. “I wanted to be involved in football, so Ian and I have worked with the current owners and have got it over the line. Without the co-operation of Mark Stevens and Alan Pook, in terms of the debt and the shares, it wouldn’t have been possible or gone as smoothly as it has. “It was a pretty easy decision, though. Starting a football centre and having a football club is something I wanted to do. It just so happens it was the perfect timing that Worthing were struggling and it’s the right time for me to come in and try to help out. “Setting up Worthing Borough was just a stepping stone to get back involved with football. I’d been out of football for four years and my mates, since the day of my accident, really, had been saying to set up a club and they’d all come to play for me and they kept to their word. Dowell feels the club can aim for Conference-standard football and is excited by what lies ahead. He is delighted to be back involved in football and said: “I always wanted to get back involved but I didn’t realise it would be quite so much, so quickly. “I only started with football again last year, when I set up Worthing Borough. “I just had to get my confidence back. It’s things like going back and meeting everyone again in a different situation. The support of my family and friends has been what I needed. I couldn’t have done it on my own. You need people to say you can do what you want and you need positive people around you. Dowell received a Herald Community Stars Award for outstanding bravery in October, 2010, and he said: “That was brilliant, I was still in hospital at the time and looking back on the day and the night, it was a good experience. “I was in hospital for ten months and have just been getting my confidence back since then to get to where I am now. “I’m in a completely different situation, some people find it hard to talk as they just remember me from how I was before.